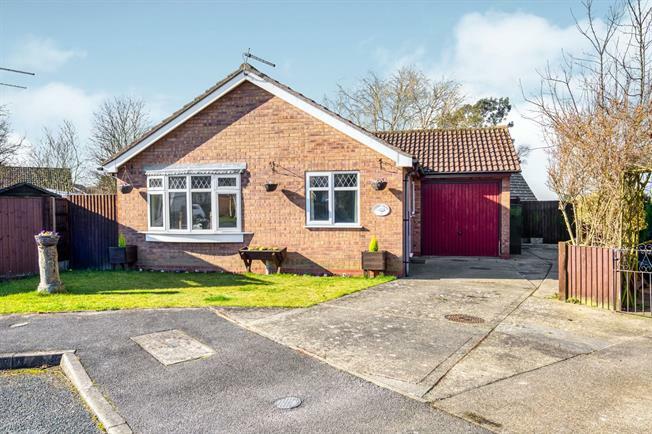 2 Bedroom Detached Bungalow For Sale in Skegness for Asking Price £175,000. Superbly presented detached bungalow which has recently been fully upgraded throughout with high specification fittings including a new kitchen, bathroom with a shower cubicle, floor coverings, new double glazed windows and doors throughout and a new boiler which is housed in the garage. The accommodation comprises of: Two bedrooms, bathroom, kitchen and lounge, single garage and a lovely corner plot with open countryside views to the rear. A viewing is highly recommended to fully appreciate the quality of this bungalow and its superb location. Double glazed door. Radiator, laminate flooring. Access to the loft. French double glazed doors opening onto the garden. Double glazed window facing the side.. Radiator, laminate flooring. Television aerial point. Double glazed door opening onto the garden. Double glazed window facing the rear overlooking the garden. Radiator, laminate flooring, part tiled walls, spotlights. Roll edge work surface, wall and base units, single sink, overhead extractor, space for freestanding cooker, dishwasher, washing machine and a fridge. Double glazed window with frosted glass. Radiator, tiled flooring, tiled walls. Low level WC, panelled bath with mixer tap, single enclosure shower, pedestal sink with mixer tap. Wall mounted gas boiler. Light and power, up and over door. The property is approached via a driveway with ample parking for vehicles, caravan or motor home leading to the single garage and access to the rear garden, there is also the storage cover for the calor gas bottles. The front garden is open plan and is laid to lawn. The private and enclosed rear garden has open countryside views to the rear and is laid to lawn.